The PNG Supreme Court’s declaration at the end of April that Manus Island detention was unlawful has been over-shadowed by the sheer horror of the events on Nauru. Shockwaves from Omid’s self-immolation, followed a few days later by the attempted self-immolation by Hadon, a young Somali refugee, rocked Australia and went around the world. The tragic actions of Omid and Hadon have fuelled the daily protests on Nauru. Scores of refugees have quit their jobs in protest, bringing pleas to return to work from Nauruan officials. But the detention regime there is unravelling, bit by bit. Amidst that despair however, there is a silver lining. The decision by the PNG Supreme Court means that one half of the government’s offshore processing regime is finished. Not only is detention on Manus finished; the PNG and Australian governments face hefty compensation payments to the asylum seekers for the breach of their rights for the almost three years they have been unlawfully held there. The Australian government is thrashing around—prolonging the agony on Manus Island and desperately trying to avoid the consequences of the decision in PNG before the election. High-level discussions between PNG and Australia have begun. Peter Dutton has insisted that those who are found to be refugees can stay in PNG and the others can be sent home. But that ignores the court’s finding that the asylum seekers were taken to PNG unlawfully. The law says PNG cannot send the asylum seekers anywhere but back to Australia. Nauru was never going to be a destination—the detention regime there is struggling to cope. And Dutton’s recent announcement that Manus people will not be sent to Nauru has ruled that out. Dutton and Turnbull continue to say that the asylum seekers will not come to Australia. This is for public consumption. There is actually little option for the government other than to bring them here. Both Turnbull and Dutton have suggested there could be settlement in “third countries”. Labor’s immigration spokesperson Richard Marles, the architect of the PNG solution in 2013, criticised the Coalition government for not having negotiated a third country. But there is no third country solution for either Liberal or Labor. 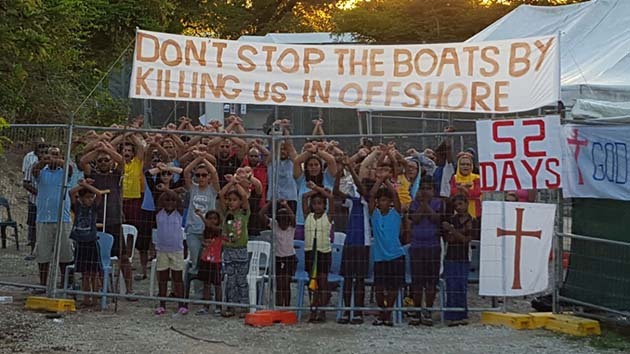 Australia’s offshore detention arrangements have been shunned by the UNHCR and the world’s resettling countries are not going to take asylum seekers that are regarded as Australia’s responsibility. Canada has already welcomed over 26,000 Syrian refugees since November 2015, compared to Australia’s paltry 180 of the 12,000 it has promised to take. Canada is not about to take 1000 people that Australia dumped on Manus Island. New Zealand has said it will take 150, but Australia will only agree to that as a face-saving measure—once all other options are exhausted and they are faced with having to bring them to Australia. This is how Liberal Prime Minister John Howard used New Zealand when Nauru was first opened after 2001. Australian governments have had almost three years to find “third countries” but never have. Dutton keeps mentioning Cambodia, but this is a fantasy. The Cambodia deal to accept refugees from Nauru has been a fiasco. Further legal action in PNG and the Australian courts will put even more pressure on the government. The pressure is mounting on Labor too. More candidates have come out against the offshore detention and the turnback policy of the Labor leaders. But there is no room for complacency. Both Liberal and Labor will do all they can to prevent those that they sent to hell on Manus Island from coming to Australia. We should expect more dirty tricks like attempts to frustrate the courts or increase the bribes for people to return home. The people power of the grassroots “Let Them Stay” campaign has kept the 267 asylum seekers from Manus and Nauru in Australia, and stopped baby Asha being sent back to Nauru. The same people power will be needed to force the government to bring all the asylum seekers and refugees from Manus and Nauru. The “Bring Them Here” rallies during refugee week in June could not be at a better time—two weeks before the election. We need to make the rallies as big as possible, with all the union support we can organise to make it clear that there is no alternative but to bring them all here.